You may not ha ve given much thought to your office’s reception desk in the past. But the reception area is the first impression visitors get when they walk in to your business. A friendly face and an attractive reception area will help them feel welcome in your workspace. Take some time to choose the right reception desk for your space. There are many advantages to a curved reception desk for your welcome area, including space for multiple receptionists, better aesthetics, and additional workspace. See if a curved reception desk is right for your office. You only get one chance to make a first impression. Make it right with a curved reception desk. Your interior design choices reflect the professionalism of your business and the aesthetic sense of your business leaders. Choose a stylish curved desk for your lobby, salon, or waiting room for a modern appeal. A curved reception desk looks great from any angle. If you have a large reception space, a wide curved welcome desk can face the entire room, inviting visitors from any angle. In a one-person desk setup, the receptionist has more space to work with compared to a traditional rectangular or salon design. You can also find innovative curved desks with space for two or more receptionists, with modular designs that enable versatility and enhanced functionality. Choose from fantastic options like Modern Office Furniture’s stylish 2-Person Wrap Around Glass Top Reception Desk or chic White Curved L-Shaped Glass Top Reception Desk. Create a space that works as hard as you do and looks great while doing. 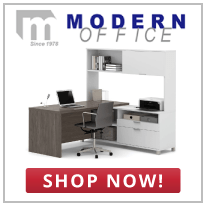 With a wide selection of reception desks, Modern Office is an affordable and quality destination for your office furniture. Make the investment in your business’s first impression with a curved reception desk. Your employees and visitors will appreciate the difference. Order your curved reception desk from Modern Office today.